I was excited when I arrived at “Maymont,” the magnificent Gilded Age mansion in Richmond, Virginia. I had not visited for years and that morning I was going to meet the Curator, Dale Wheary, for a chat about the interiors. Built in 1893 by the Dooley’s, a wealthy family in Richmond, Maymont is a wonderful example of what is called the Victorian “Romanesque” period—the building and decorating of the house spans the years from 1893 to 1925. Within you will find Tiffany windows, as beautiful as any you might imagine, with wonderful plastered ceilings, a charming Swan bed and a well preserved historic house museum which Dale has been the curator of for over 30 years. Ms. Wheary told me how before the Maymont Foundation took over the house, the city’s Parks and Recreation Department had the job of the maintaining the mansion. As is often the case with Historic House Museum’s, the Dooley’s had left no endowment to care for and curate the museum. She showed me a good example of what happens when well meaning but uninformed “restorations” are done. In the downstairs parlor there is much plaster ornamentation on the ceilings and walls, which was originally gilded. During the period the Parks and Recreation Department had oversight of the mansion the Department simply used gold radiator paint to do the job of the plaster restoration (OMG!). Wisely using this as a teaching tool, Dale decided to leave a small plaster rose unrestored to contrast with the properly restored gilding of the delicate plasterwork on the wall above the mantel. Visually, the visitor is quite shocked to see the contrast. There are so many things about the house that are fascinating. For instance , there is no wallpaper in the house as the Dooley’s preferred the walls hand painted or stenciled and they did use silk damask upholstered walls in the two drawing rooms . The draperies in the home are amazingly almost all original and on all the windows you will find the original venetian blinds that were an excellent way to control light streaming into the room, in fact you will find the original ventian blinds on all the windows of the house. 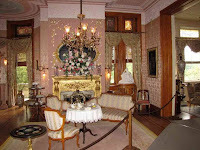 The opulence in draperies that are associated with the Victorian era especially in a house as significant as “Maymont,” is not really present; certainly the textiles used were of very fine quality, but the window treatments are not excessively lavish. As a designer I can see that whomever choose them had good instincts about the draperies as they frame the windows that look out on a beautiful vista. She seemed to recognize that there is so much ornamentation within the rooms anything more ornate would be way too much aesthetically. Dale Weary has steered the restoration of this treasured historic house from a much neglected monolith to a jewel. Her passion for detail and “getting it right” is evident throughout and never more so than in the recently restored ‘below stairs” exhibit that is superb. The new exhibit reflects the lives and duties of the many African American workers in the home. With the accompanying cultural material information, this exhibit is a wonderful example of showing the visitor the world these household staff members lived in. As she walked me through the beautiful rooms, Ms. Wheary mentioned often that the Maymont Council (the preservation support group now in its 27th year that helps fund conservation and restoration projects) are wonderful stewards of the Mansion. She showed me a little booklet that is a wish-list of sorts with objects or future projects listed along with photographs and an estimated cost associated with them. From small requests to those in the thousands it was a great tool to see at a glance what was needed.